Please join in COSACOSA's work! in our city's historic Manayunk neighborhood. Our phone number is 215.385.2554. Our fax number is 215.487.2354. Our general email address is info[at]cosacosa.org. Our work relies on the ongoing support of people like you! • Donate now through Network for Good buttons on the left or above. • Send a check directly to us made payable to "COSACOSA art at large, Inc." at the address above. • Give at work through the United Way; COSACOSA's donor choice number is 42788. Please let us know if you would like your donation to be targeted for a specific COSACOSA program initiative. All donations are fully tax deductible. Thank you for your support! Become a COSACOSA volunteer. From art assistants to community coordinators, from data base dynamos to reticent researchers, we have a job just right for you! Create new art specific to your community and connect your neighborhood with a city-wide project ! 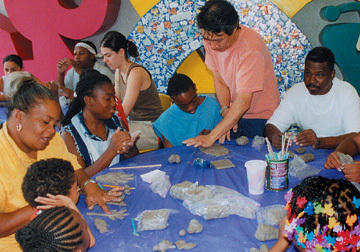 Families work together to create clay sculptures of "what connects us?" for COSACOSA's Connection project at Philadelphia International Airport with artist Dit Wah Deng. 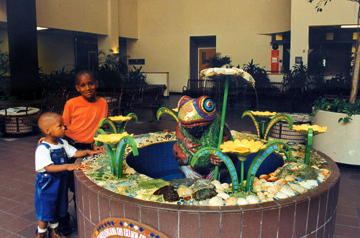 Community youth created a Frog Pond from found objects at St. Christopher's Hospital for Children with artist Lilli Ann Rosenberg as part of our Journey project. COSACOSA is a not-for-profit organization. Donations are tax-deductible to the full extent of the law. by calling, toll free, within Pennsylvania,1.800.732.0999. Registration does not imply endorsement.